The Guru SMS Crusher Is A Massive Game Changer. Ready to put the Guru to work for you? Our offer comes with a Satisfaction Guarantee. 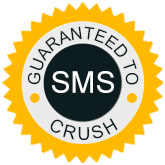 The Guru SMS Crusher is being used by thousands of marketers to find targeted mobile phone numbers to generate thousands of quality leads. After extensive research on what was available to marketers for getting mobile numbers from the Internet, our development team created the Guru SMS Crusher. The Guru makes it easy to find thousands of mobile numbers in just three steps. Whether you need leads or you are a lead broker, you will be excited with what the Guru can do for you. Internet entrepreneur making thousands in both affiliate and network marketing. I started gathering sms phone numbers and was glad to find out how easy the Guru is to use. I gathered thousands of numbers in days and have started making money. Yahoo! It can be hard to get leads and with emailing getting harder I had heard of SMS marketing. Once I took the step to use SMS I knew I could not live without it. It makes things easier. High-tech tools for a low-tech, stay-at-home mom. This is the software I have been waiting for, gather mobile numbers fast, without proxies, VPNs and captchas, and export the results in two neat lists that are ready to load into my SMS Bomber. The first time I used it I was able to get over 6,000 results. In another market I was able to gather over 42,000 mobile numbers in less than 48 hours. Watch my video. This is the software I have been waiting for. I've spent thousands of dollars over the years to get the latest tools to enhance the automation of my marketing. I can say without a doubt that the Guru is in the top ten of my purchases. This software is worth thousands. I made $19,000 in 5 months with SMS Marketing. The Guru is the best tool I have seen, and I have tried a number of them. I get more numbers in less time. Moving on to a six-figure income. Ready To Get The Guru Working For You? Ready to increase your traffic and sales? You'll Be Surprised At The Results! I have been working with online marketers since 1998 and know that using tools like the Guru SMS Crusher can often separate the successful from the struggling.